There I have said it. He is! Last autumn, I spent days in preparation for Teza. 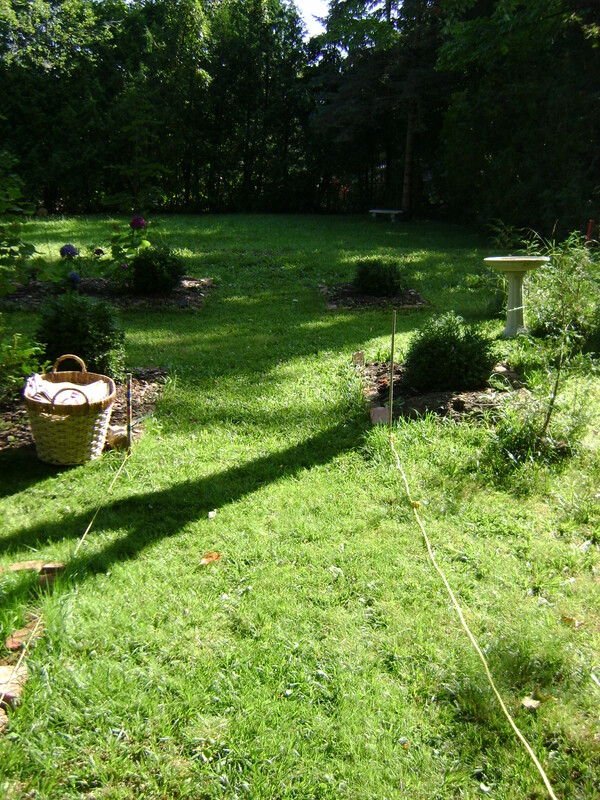 I primped, I powered, I removed unsightly shaggy bits,(weeds that is), I did everything a poor girl could do to entice him. He made vague promises, but no actual commitment. Isn’t that just like a man. Teza, when are you coming to fill me? OK, I bet that got your attention. Although maybe I should have titled it “Tezas bed”. We completed a number of projects when we were at Kilbourne Grove on our holidays in October. 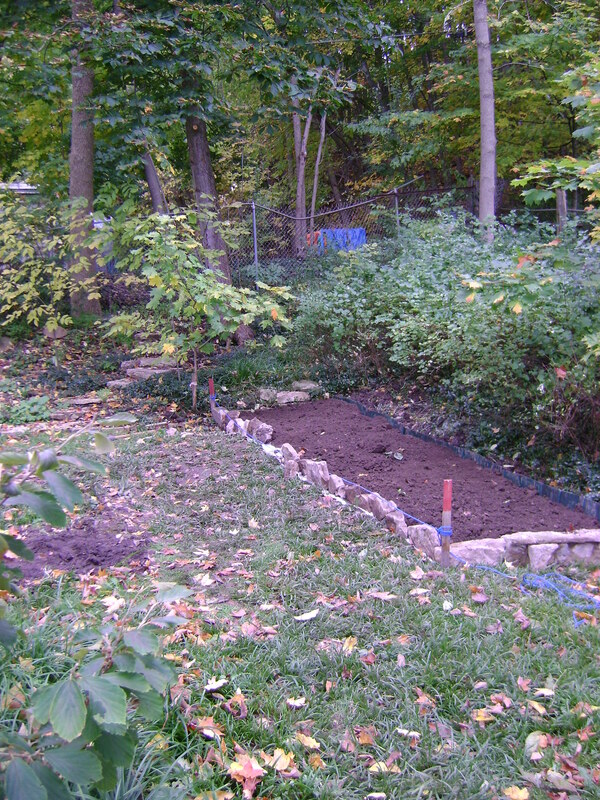 One of them was to make a new garden bed at the base of the berm, that runs along the edge of our property. 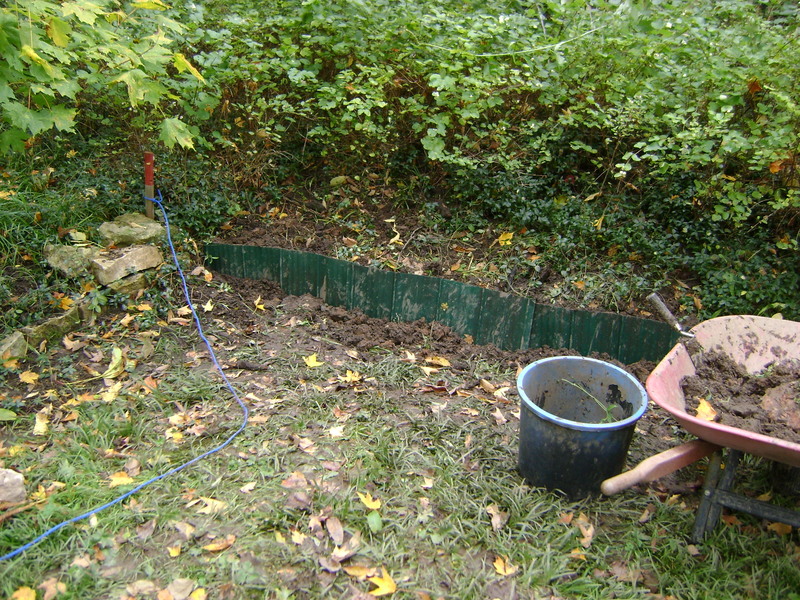 The property developer that owned it (for a few months between us and the doctor), had (basically) a large ditch dug all around the edge of the property that backed onto the Niagara Escarpment. Wow, that was one run on sentence. 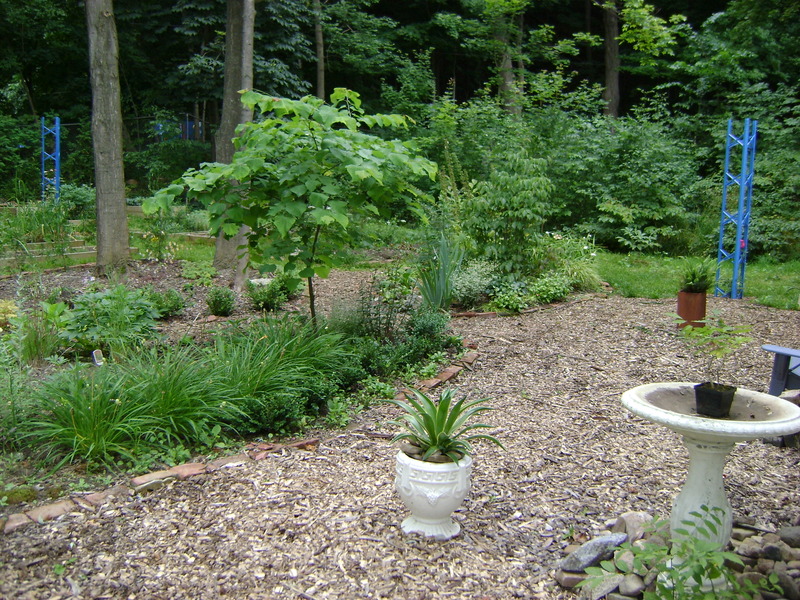 This was dug, on the advice of the city of Owen Sound, in order to redirect the runoff from the escarpment. 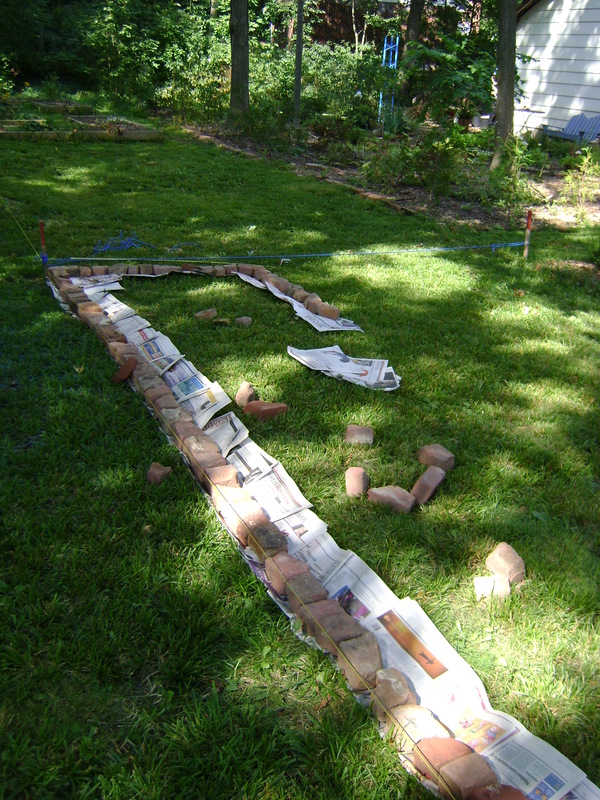 In theory, the water would hit the ditch and be diverted instead of flowing towards the house. So this left a bit of a berm approx 10 feet away from the property line fence. 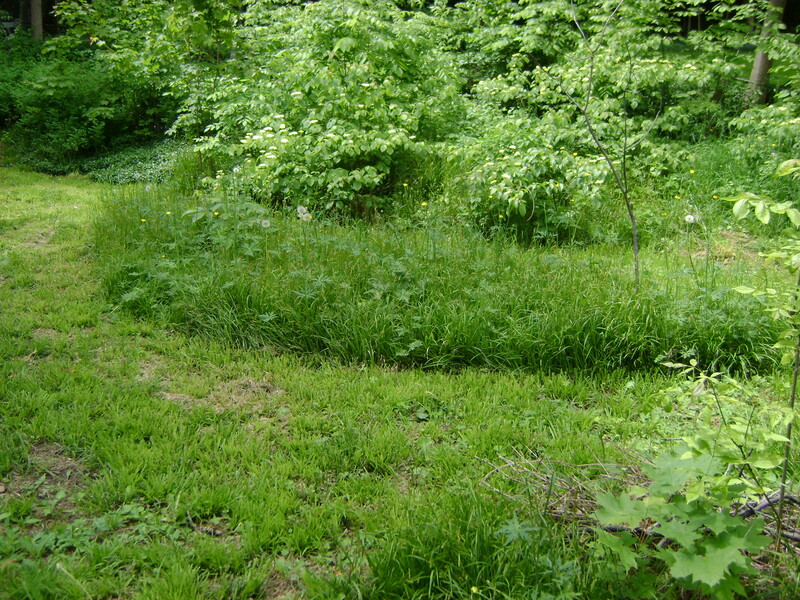 On the west side of our property, this berm has been covered with self seeded trees and shrubs, but mostly has a huge thicket of snowberry. Anyone who has the species knows it runs underground, twice now, I have been forced to dig it out as it has been spreading towards my Kitchen Garden. 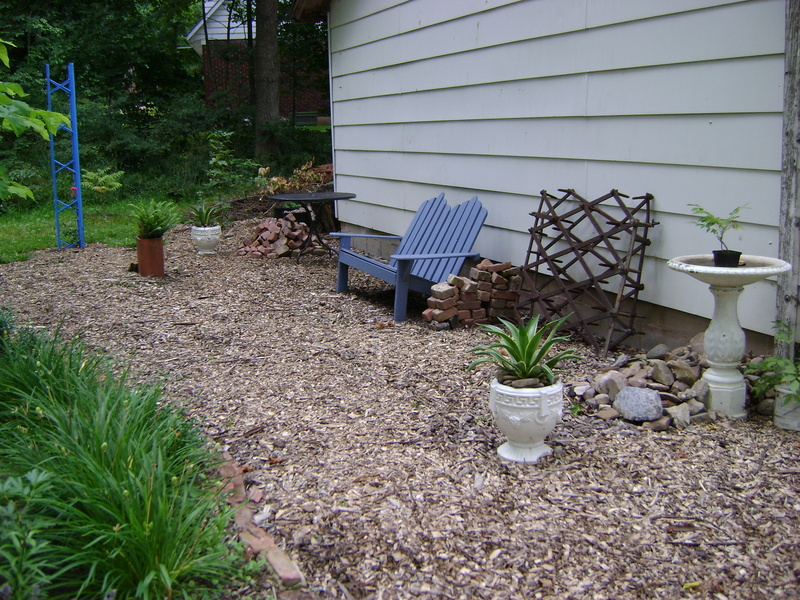 I wanted to stop it in its tracks and also build a bed at the base of this berm. Anyone who has read Teza or my blogs knows that he is short of space for his kids, and is always looking for a foster home for them. I thought that he might be able to use this space. This is what it looked like before we began. 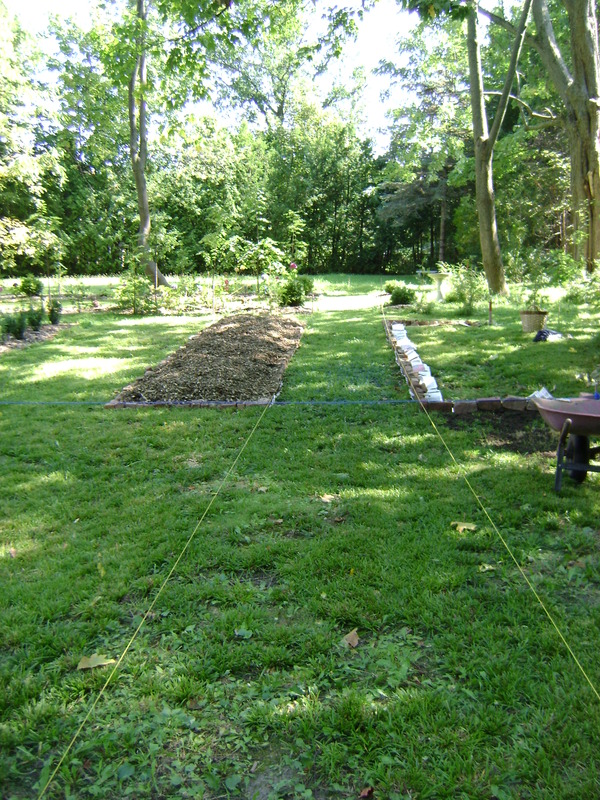 I am standing in the Kitchen Garden and looking directly west. 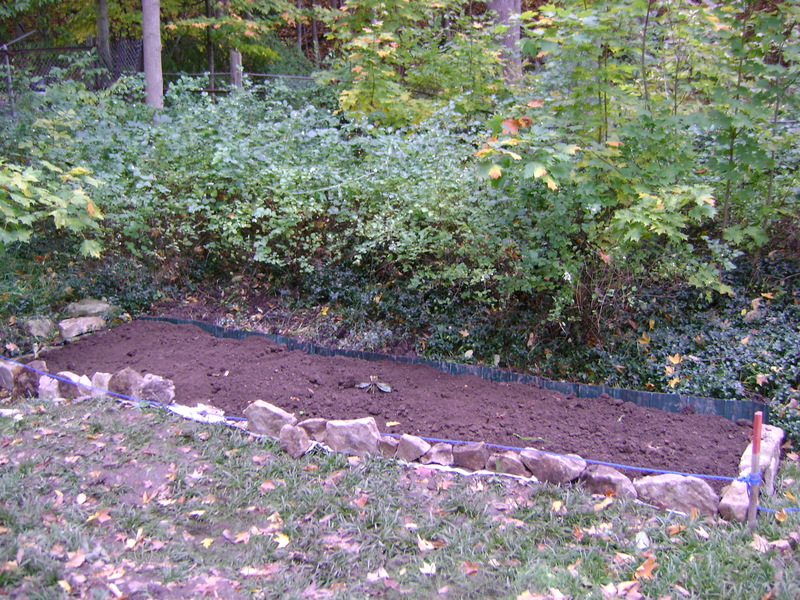 We started by sinking metal strips, approx 2 feet deep, hoping that this will, at least inhibit, the snow berry from moving into this area. 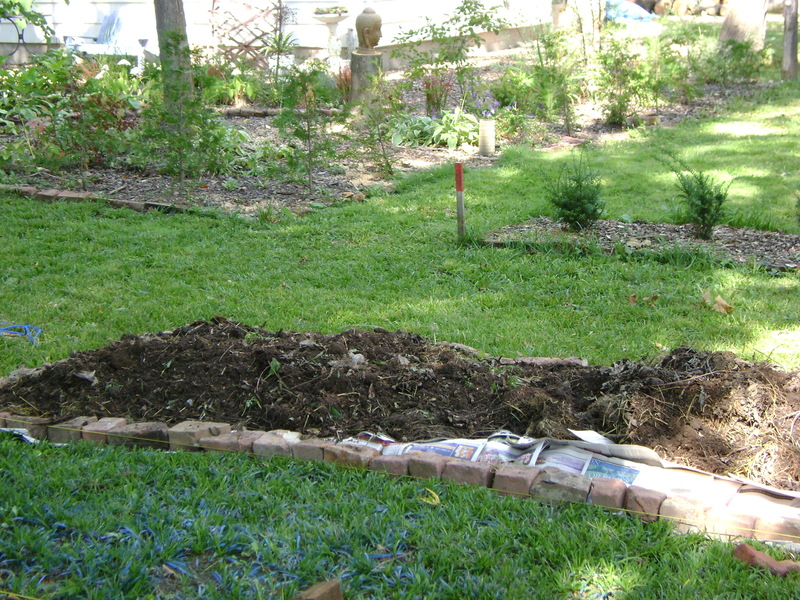 Then, using rocks that we have unearthed while gardening, we began making an edge. 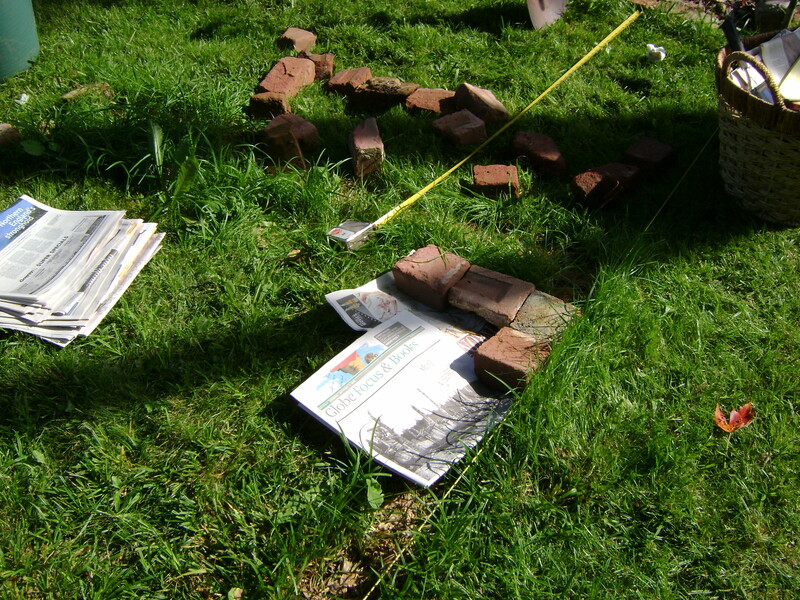 Once again, using my time proven method of laying down newspaper on the sod, and then topping with soil. 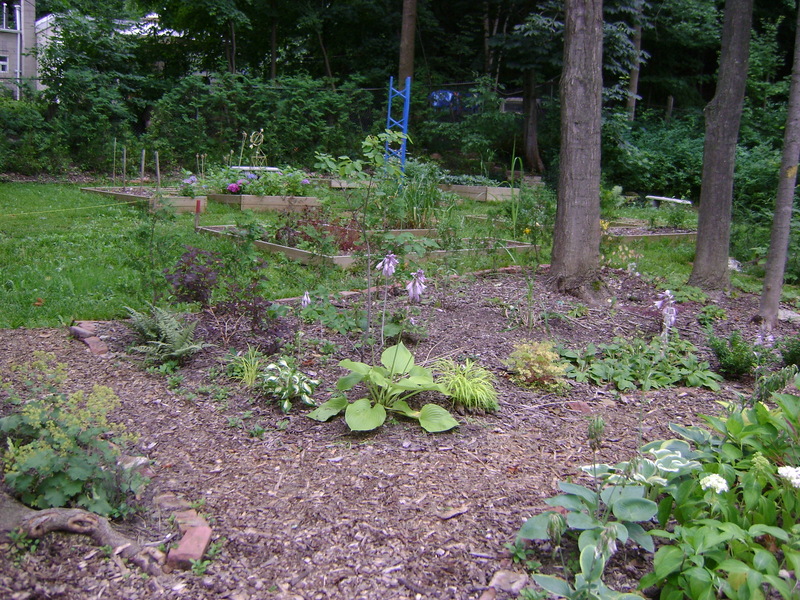 We then applied a thick layer of mulch to keep the weeds down in the spring. Here it is, (mostly) finished. 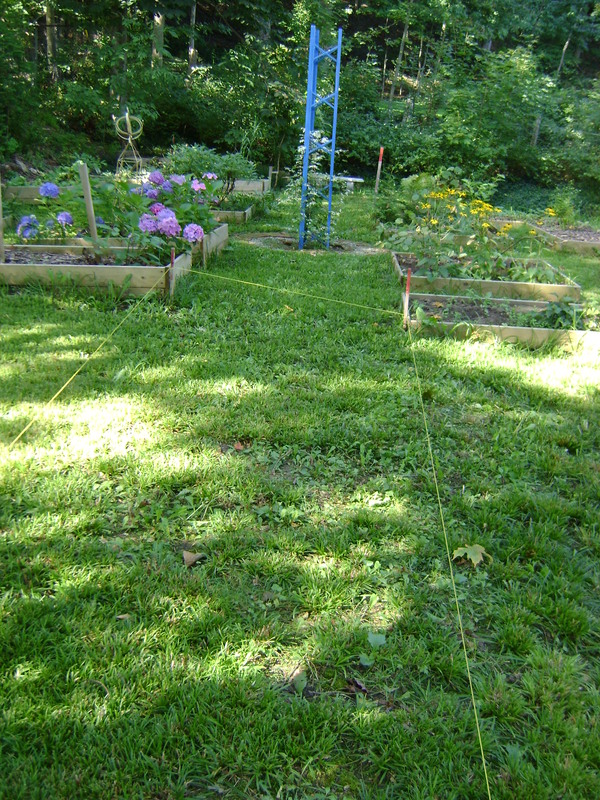 This bed measures approx 5 feet x 25 feet. Do you think that you could fit a few kids in there Teza? Finally a nice weekend and I convinced Ian to get a lot done. 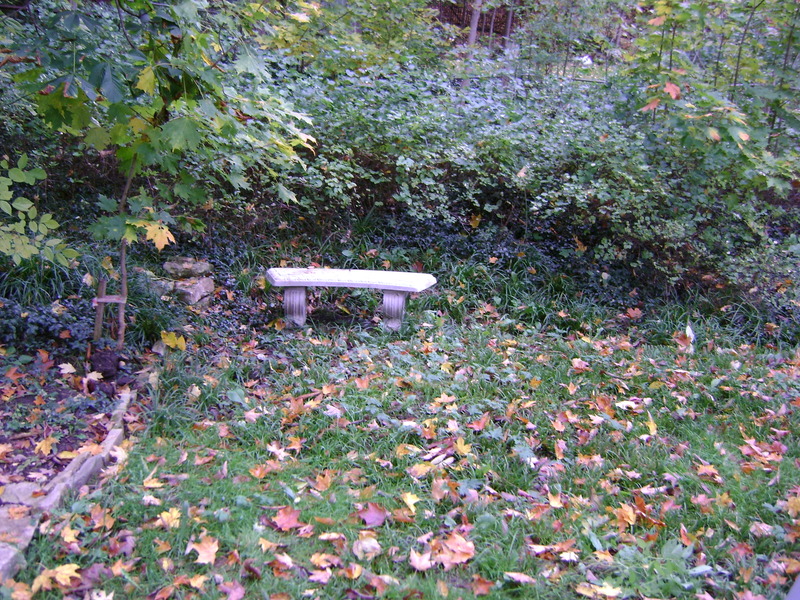 While he stained the screen porch, and the new slats for the black bench, I spent the whole day building a new bed around the serviceberry and witch hazel.